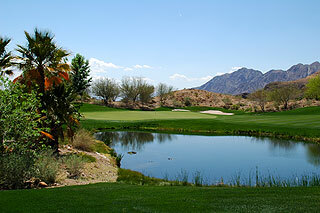 In 2008, Zagat Survey ranked Cascata #1 in the country for golf facilities so Cascata is not just a golf course - it is an experience... like no other in Vegas. 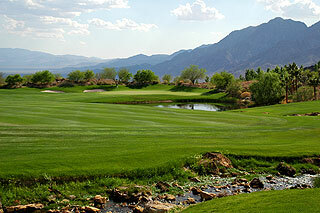 Actually located in Boulder City about 35 minutes from the strip, Cascata recently opened to the public - offering players a round of golf they will not soon forget. The stunning design is just part of the equation however, as the facilities and service make one feel like this is their private club for the day. Upon arrival visitors are treated to valet parking then whisked off for a short tour and afforded their own locker. The entrance to the clubhouse is spectacular, as a cascading stream runs through the atrium and a huge picture window provides an initial glimpse of the practice facilities and immaculately landscaped grounds. 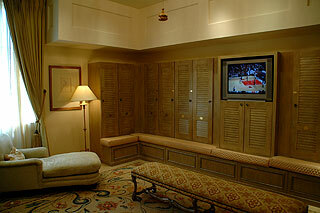 The locker rooms are furnished with comfortable sitting areas, showers, toiletries (including complimentary sunscreen, toothbrushes, razors and shaving cream, etc.) and with large flat screen television televisions mounted into the walls. The pro shop is spacious and wonderfully appointed, and cookies, fruits, teas and juices are situated in a refreshment station nearby - more comps for visiting guests. Prior to our early afternoon round, we enjoyed one of the best chicken Caesar salads imaginable in the adjacent restaurant/lounge. We are told all items on the menu are prepared fresh, and are delectable. 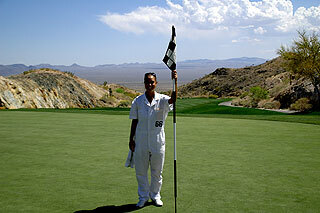 Caddies are mandatory (although carts are used), and as we witnessed, are very personable and helpful. Ashlea, pictured above, was a great guide who helped to make our experience even more memorable. The carts are as plush as the course, with velour upholstering on the seats and dual coolers for storing water and beverages. 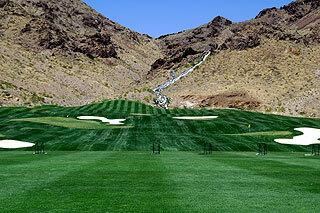 A 418 foot man-made, cascading waterfall saunters down the mountain side behind the targeted grass range, and palms plus indigenous and tropical foliage provide a picturesque scene around the large putting green. Range balls are complimentary, but we did not linger, as we were anxious to get out on the course. 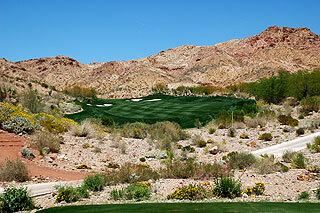 This par 72, 7100 yard Rees Jones layout traverses some unique topography, with mountain side tee boxes, vibrant canyons and lush landscaping feeding the senses - and creating some extremely interesting golf holes. There are four sets of tees on each hole, that play to distances and slopes measuring 7030 to 7137 yards/ 142 or 143 slope, 6664 yards/138 slope, 6206 yards/135 slope, and 5591 yards with a slope of 117. As these ratings indicate, this is a formidable test from the two back tees, and can be a great challenge from the golds (6206 yards) as well. Wind can be an uncompromising factor - but as the golf gods would have it - there was merely a gentle breeze during our review round. With excellent conditions, we found the course to be extremely playable. There are seven gorgeous water holes in the design, with the short par three 4th and 7th holes being absolutely spectacular. 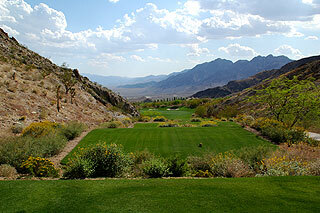 The steams leading down from the mountain waterfalls play along the sides of holes one, 12, 14 and 18. 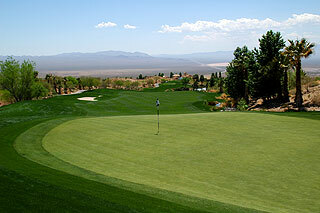 Fifty two soft sand bunkers, along with numerous high desert waste areas also serve as hazards near the landing zones and greenside. The topography is so dramatic, that at times it can be confusing as to whether or not a shot is going uphill or down...again...ask your caddie, who learns the ropes by playing this course as often as he or she is able. Sprinkler heads on the fairways are marked to the center of the green, and the caddie has pin placement info. 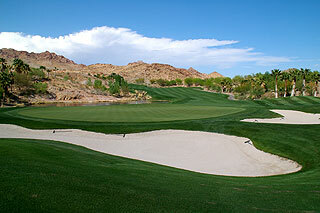 One tip we can offer - if a shot is uphill - it is probably more uphill than it appears - be sure to take enough club. 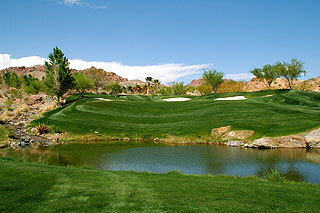 Other than that - once you pay the upscale green fees - you are free to enjoy your membership for the day. Come early, have breakfast or lunch (reasonable prices), utilize the fine practice facilities, grab some fruit and cookies, and make use of the wonderful locker room! One guarantee - you will be impressed by the topography (the cart ride to the 17th is special) and course design, and by the excellent service and conditioning. 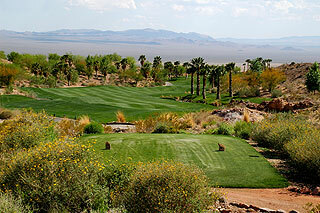 The photos in this review merely begin to do the course justice. 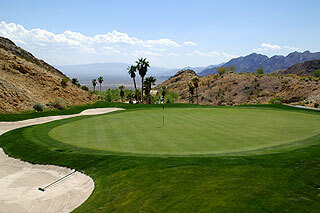 For more information on Cascata - visit the TwoGuysWhoGolf.Com information page by clicking here.